State Superintendent of Public Instruction Tom Torlakson visited science classes at Edna Brewer Middle School in Oakland recently to see students' and teachers' response to the new science standards. California’s new science standards were in full flower last week at a middle school in Oakland when 8th-grader Amy Zhang strung together a battery, wire and carpentry nail and marveled when not one, not two, but five paper clips jumped to the nail magnetically. “Wow. We did it. I thought it wasn’t going to work,” she said to her classmates at Edna Brewer Middle School in Oakland Unified, one of eight districts and two charter school organizations that have been early adopters of the Next Generation Science Standards. They are all participants in the California K-8 Next Generation Science Standards Early Implementation Initiative, a “fast start” demonstration project for the new standards adopted by California in 2013. The paper clip experiment is an example of hands-on lessons encouraged in the new science standards, which among other things puts science experiments at the center of science education. “Engaging in the practices of science helps students understand how scientific knowledge develops; such direct involvement gives them an appreciation of the wide range of approaches that are used to investigate, model and explain the world,” according to the science framework approved by the State Board of Education this past November. The framework provides a blueprint for implementation of the new standards in the classroom. The standards encourage students to see connections and patterns among life science, earth and space science, physical science and engineering. That’s especially the case in grades 6-8, according to California’s “preferred model” for science instruction that encourages teachers to weave together each of the three science disciplines and engineering. Historically, earth science has been taught in 6th grade, life science in 7th, and physical science in 8th. The changes are good news for Amy and some of her classmates, who say the new style of teaching science is a lot more fun and interesting than just passively taking notes. This spring, California students in 5th, 8th and a sampling of 10th through 12th grades will take pilot versions of a new test based on the science standards. Schools won’t begin assessing students with a fully operational test until spring 2019, but teachers say the early results are promising. Amy’s teacher at Edna Brewer Middle School, Jeri Johnstone, said students are more engaged, doing higher-quality work and are showing improved understanding of core scientific concepts. “Our science is loud, our science is messy. We have our own Exploratorium here,” Johnstone said. In her classes, Johnstone’s students have pulled table cloths from under place settings to study the force of motion, launched hundreds of paper airplanes to test aerodynamics, learned about Newton’s law of inertia through skateboards, and studied pH balances by investigating why Lake Merritt smells funny on certain days. Eighth-grade student Isabel Barragan said Johnstone’s science class has inspired her to be a doctor someday. WestEd is overseeing the early implementation program, which is funded by the S.D. Bechtel Jr. Foundation. Other schools across the state have also begun implementing the new standards, but those in the WestEd program will share what works and what doesn’t with other districts. 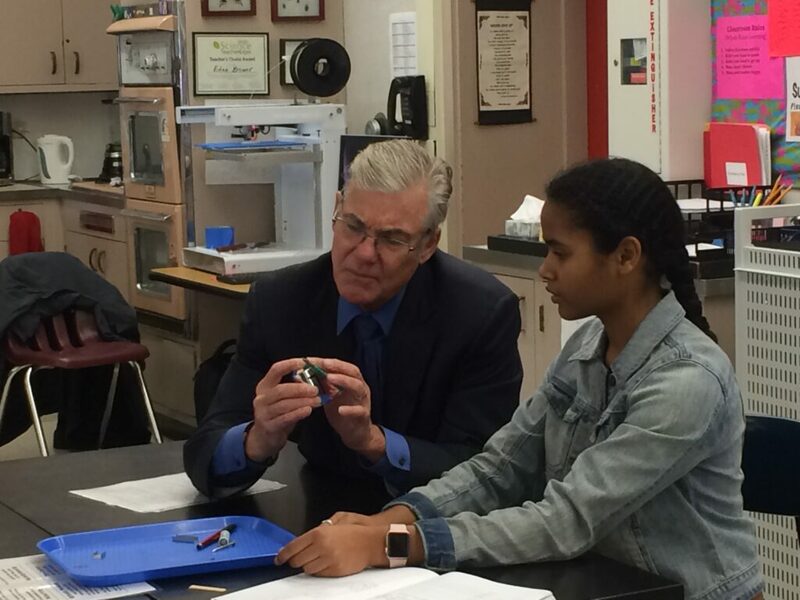 California’s State Superintendent of Public Instruction Tom Torlakson visited Edna Brewer Middle School last week and sat in on four science classes, helping students with experiments. Torlakson has been a strong advocate for the new science standards. The new standards incorporate the latest scientific research and are intended to boost students’ overall science performance. The standards are modeled on those of 10 countries whose students traditionally rank among the world’s best in science. Worldwide, students in the United States ranked 25th out of 64 countries on the 2015 Program for International Student Assessment (PISA) of 15-year-olds’ scientific knowledge. Singapore had the top score, and the Dominican Republic scored last. Within the United States, California places near the bottom, according to the most recent National Assessment of Educational Progress. California’s 4th-graders ranked third from last among the 50 states, and 8th-graders ranked fifth from last. Those figures must improve if California’s tech-centered economy is to continue to thrive, Torlakson and other advocates have said. The new science standards will not be cheap to implement. Supplies and teacher training are two significant expenses districts will have to cover, finding money within their current budgets or raising money from parents, foundations or other sources, said Kathy DiRanna, statewide director for West Ed’s K-12 Alliance, which is helping lead the early implementation effort. Costs will vary at the elementary, middle and high school levels, and could range from tens of thousands of dollars for a fully equipped science lab to a few hundred dollars to pay for basic materials. Johnstone said she spends at least $650 annually on supplies, about $400 of which comes out of her pocket and $250 comes from the PTA and private mini-grants. 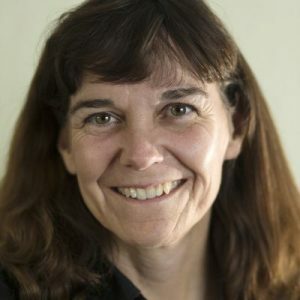 Teacher training, especially at the elementary level, will have to be extensive and ongoing if the new standards are going to be effective, said Jessica Sawko, executive director of the California Science Teachers Association. Money for training is available through districts’ discretionary and professional development funds, as well as from grants, but districts will have to have a strong commitment to prepare their teachers, she said. Training sessions on the new standards are held several times a month throughout the state. Sessions range from a few hours to full, three-day weekends. The association website includes a list of upcoming workshops as well as information about funding. In the Palm Springs Unified School District, one of the eight districts in the early implementation program, the standards have been popular with students and teachers alike. So far, teachers at the middle school level have embraced the standards more than their elementary or high school counterparts, although the district expects it to catch on at all levels eventually, said Palm Springs Unified K-12 science specialist Peter A’Hearn. Engineering projects so far seem to be the best way to ease into the new standards, he said. Constructing bridges from popsicle sticks and spaghetti is something engineering students have been doing for decades, and the concepts dovetail perfectly with the Next Generation Science Standards. “Engineering is already such an iterative process,” said A’Hearn, who has been blogging about the transition to the new standards. At the Galt Joint Union Elementary District in rural Sacramento County, another of the early adopters, teachers say the transition has been mostly smooth and so far very rewarding, said Barbara Woods, a district curriculum coach who’s overseeing the new science standards. Still, some teachers have had a tough time switching styles, she said. Science experiments can be a challenge for a teacher because often there’s no right or wrong answer. For example, in the paper clip experiment, some students may be able to lift five paper clips onto a magnetized nail, others won’t get any because the wire’s not properly connected, and others may get 20 or more because they used a stronger battery. Students might re-try the experiment a dozen times with different results, learning something new each time but not coming up with uniform answers. The state will begin administering pilot science assessments this spring. No scores will be released, but teachers at Edna Brewer Middle School say their students will be prepared. It is great to see young students, Involving in science activities and becoming successful. Fine example of “next generation” science. I did exactly the same experiment confirming what I had already learned about electromagnetism in my one-room country school in Iowa over 60 years ago. I also built a little electric motor that worked based on a picture of how to do it and why it worked in my 7th or 8th grade science book. My what progress.